After the Jovians introduced capsule technology to the empires several methods have been tried out regarding the visual presentation of the surroundings to the captain enclosed in his capsule. The first method tried, and the one the Jovians first used (and sometimes still do), was to use the data from wide range of scanners to paint a realistic view of the ship’s surroundings in the mind of the captain. But after intensive experimentations it was discovered that this caused severe nausea and disorientation for most captains not of Jove origin. Other high-tech methods also had to be discarded for the same or similar reasons. In the end, the empires discovered that simple cameras directly connected to small screens inside the captain’s helmet were the best solution. At first these cameras were mounted on the hull of the ship, but with the advent of electrical energy weapons these cameras became too vulnerable to damage from electrical charges. The Gallenteans were the first to experiment with cameras mounted on drones hovering around the ship. They first developed this method when researching more efficient point-defense weapons. This hovering method later caught on with the other races and is now common practice, with all the empires manufacturing their own types of camera drones, all based on the same principle. At first only one camera drone was used, but today they are two, for stereoscopic vision. The camera drones are suspended some distance from the ship. They attach to the ship by using a combination of an attractive magnetic force and repulsive electromechanical force, this also allows them to orbit the ship at any desired position. This means that the drones never need replenishing or refueling. 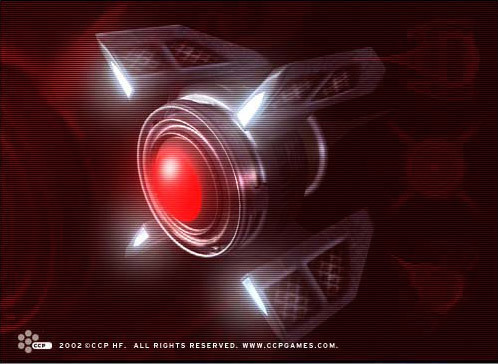 The camera drone can be commanded through the captain’s neural link. This gives the captain tremendous ability to get a clear view of his environment in a quick and comprehensive manner. By stationing the camera drone some distance from the ship the drone is not as susceptible to weapon outbursts hitting the ship’s hull. The drone can still be destroyed, either by accident, such as passing debris or stray shot, or on purpose. All ships have abundant supplies of spare camera drones stored away for such occasions and the captain has to be fairly clueless to run out of camera drones. The fact that the drones are stationed outside the ship’s shield makes it impractical to try to protect them. Simply storing lots and lots of them is much easier, as they’re very cheap. When the ship uses a stargate the camera drone needs to move back into the ship when jumping. It re-emerges as soon as the ship exits the jump. This does not apply to warping, when the ship travels between planets within a solar system. Although the camera drone serves as the main visual tool of the captain cameras have been used in more ways. Some missiles sport a camera in their nose, allowing the captain to see directly where the missile lands.